The FT Adapter offers a high performance cable feedthrough with built-in strain relief for easy integration into a variety of communication networks and devices. RALEIGH, N.C. - Aug. 9, 2017 - PRLog -- M2 Optics Inc., a manufacturer of customized testing and networking platforms for fiber optic communications, has been awarded a patent (#9,696,512) by the USPTO for a specially designed fiber cable feedthrough branded the FT adapter. 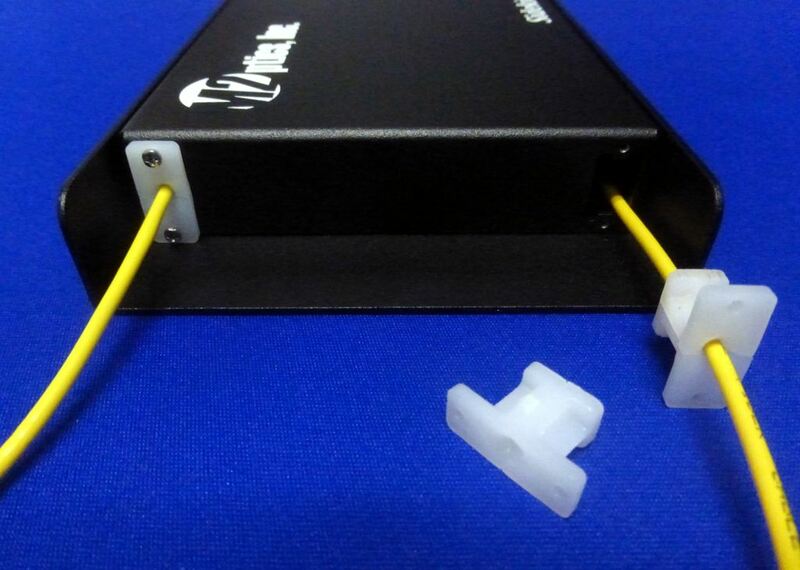 The purpose of this adapter is to allow a fiber optic cable to pass through a variety of panel types, such as a device enclosure, without requiring an additional connection point on the panel itself. The traditional practice of connecting an external cable to a device has been to use a panel-mounted adapter that simply allows for a common mating point between both the internal and external cables. While this is acceptable for many applications, it does result in a small loss of the fiber optic light signal at that connection point. For more demanding applications requiring minimal signal loss, a cable feedthrough is preferred in order to eliminate that extra connection point. While generic rubber grommets can serve as a feedthrough, they come in different shapes and sizes and often do not provide a strain relief mechanism, which results in the need for different layouts and/or additional parts. As a better solution, M2 designed the FT adapter in a footprint that matches commonly used fiber optic industry connector mounts, such as the popular SC cutout, to limit the need for panel modifications. The FT adapter grips the fiber cable in a manner that prevents slippage and offers built-in strain relief, without the use of extra parts. The conical openings also help to prevent the cable from crimping if it is bent close to the panel. Lastly, the 2-piece design allows the adapter to be added at any point on the cable, making it easy to integrate and install into various devices and systems. "This winning idea is the result our engineering team identifying a practical solution to suit a customer's special fiber testing application", states Kevin Miller, CEO of M2 Optics. "Working within a scenario where re-designing the device enclosure was not an option, the FT adapter was developed to offer a high performance cable feedthrough that also compliments the look of today's fiber-based equipment." The patent covers a number of related cable feedthrough configurations generated by M2 for both single and multiple cables, making it useful for a wide array of fiber optic connectivity applications. Despite not having formally announced its availability until now, M2 has already shipped these in quantity to several high-profile entities, which they expect to continue as more people become aware of this useful component. For more information about M2 Optics and the FT adapter, please contact the company directly at (919) 342-5619 or by visiting their website at http://www.m2optics.com.